Dear Monkey Surf School students and travelers around Bali, we have noticed over the years that the information provided by some guide books are incomplete or completely obsolete. It’s hard to keep up to date as Nusa Lembongan is changing so quickly. Fortunately we want to help organize your holidays and get a maximum of high quality experience so we have prepared this Travel guide of Nusa Lembongan – featuring a free map of Nusa Lembongan – filled of useful information, from insiders with the highest quality and most recent updates you can find. So here is Nusa Lembongan island, only 30 min speedboat ride from the mainland Bali. We are sure that you will experience unforgettable moments to share later back home. Great activities are to be done here : surfing, snorkeling, freediving, scuba diving, spearfishing, explore the island on motorbike or simply relax at your hotel. We advise you to book at least 3 nights to get the most of it. You’ll definitely find in Lembogan the true island experience with a slow rhythm, far from the hassle of the city. Forget your mobile phone and enjoy the amazing vivid clear blue water ! 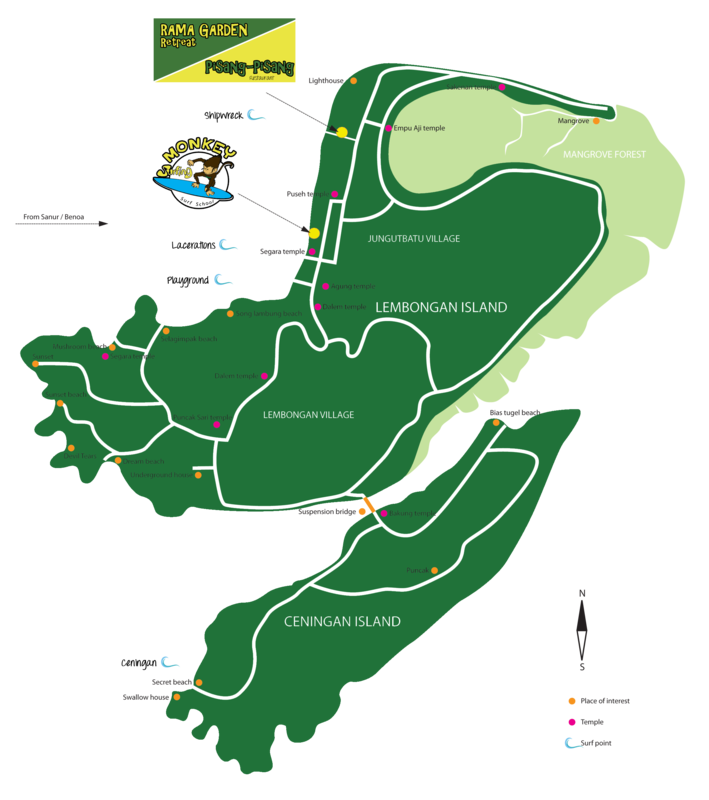 Feel free to follow this map of Nusa Lembongan below to find great highlights and activities to do during your holidays. You can discover the swamp area of the Mangrove on a small traditional boat (jukung) to enjoy the quietness of the place mud crabs and wildlife. The Ocean part of the Mangrove has to be explored by boat and offers the most amazing marine life biodiversity. You can find daily Nusa Lembongan snorkeling tours departing from Jungutbatu area that go to 3 spots. On the way to the Mangrove you can also encounter several seaweed farmings spots. The most beautiful beach to be found in Lembongan. A nice romantic escape, unfortunately not often suitable to swimming because of strong currents. Protects the boats crossing the island at night. Also a great place to take pictures from the top if you’re not scared of heights ! Small but great beach to lay your towel and relax. This house was carved over the years by a single man with very rudimentary tools. Beware of the low ceiling. The beach is small and only appears at mid to low tide but it offers a great alternative ambiance. You can watch sunset from the top of the cliff, feels like you’re at the edge of the world ! Quiet beach and area of Lembongan village, not too suitable for sunbathing on high tides. Busy beach of Lembongan village, some parts of it are good for sunbathing. This rickety bridge leading to Nusa Ceningan contributes to the island lifestyle experience with its clinging noise and adventurous look. It is broken at the moment since the recent accident and boats are doing the crossing for a small fee. The Blue Lagoon next to it has the most astonishing colors on the island. The brighter the sun is the most beautiful blue you can get ! There’s also a cliff jumping (6 and 9 meters) opened when the tide and swell conditions are good. A must-do on the island, Devil’s Tears has a unique landscape with stingy rocks and the waves crash onto it in a spectacular way. Watch out on big swell days the spray of water can be huge ! Nice scenery but hard to swim on this beach, the Beach Club offers a swimming pool to its guests which is a better option. Small harbor to get to Nusa Penida. The road to the top can be tricky but really worth its amazing view. Great pictures to take overlooking Nusa Lembongan island and Ceningan. 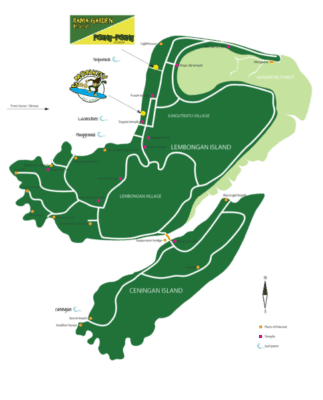 Use the map of Nusa Lembongan to get around, you won’t get lost there’s only one main road going around the island. Definitely the best option to explore the island. They can be rented easily for 60-90.000 Rp per day. Check both brakes before you rent, price usually includes at least half of the petrol tank. Nobody in Lembongan uses helmets but motorbike renters have some in case you want one. Also there are a few policemen now on the island but they don’t check license so don’t worry about getting pulled over. You can note that everything is slightly more expensive here than in Bali because of the boat transport. Unfortunately the island is getting more and more busy with cars. On the bright side for those who cannot drive a motorbike there are now several pickup service cars available to drive you around the island with a local guide. From 50.000 Rp for a simple drop off. The main road of Lembogan just got renovated so it’s now more easy to cycle around the island, just the way up the hill to Lembongan village is tough. Around 30.000 Rp per day. For the walk enthusiasts there’s a path from Jungutbatu beach to Mushroom beach following the shore line leading to some spetacular views. There’s a fantastic cruise to do from Jungutbatu beach to Mushroom beach. You’ll cross different landscapes and discover caves accessible only from the water. SUP can be rented at Monkey Surf School for 120.000 Rp/2h. Nusa Lembogan is part of 3 neighboring islands : Nusa Ceningan and Nusa Penida. Only Nusa Ceningan is accessible through the suspension bridge or boat. To get to Nusa Penida from Lembongan island you have to charter a fishing boat at Mangrove or Bias Tugel area. FIRST get to Sanur harbor, that’s where all the boats are leaving from. – Lembongan village (= Lembongan harbor in Mushroom beach) from the center to the west/south of the island, including Mushroom beach, Dream Beach, Sunset Beach and Tamarind. Each village has its own harbor so when you book your accommodation make sure you take the boat going to the right harbor. We can avoid you the hassle and organize your transfer to Nusa Lembongan island directly from your hotel in Bali to your hotel in Lembongan (whatever part of the island) ! Nusa Lembongan is Hindu same as Bali. The religion and culture is even more important here with ceremonies happening at least once a week. On the biggest ceremony days you can encounter crowded cockfights. Locals are happy to see foreigners joining Hindu ceremonies. Before entering temples make sure you wear proper clothing (at least a sarong and a sash), while taking pictures stay on side and women are not allowed to enter during their menstruation. Nyepi (28th March 2017) : same as in Bali, no one is allowed to get outside his accommodation – electricity is also cut for the day – make sure you bring some games ! Nyepi Laut (6th October 2017) : no one is allowed to touch or go in the water = no boat can get in or out for the day ! On the island locals speak Balinese, Indonesian and good English too ! Please note that there is only 1 ATM at the moment and it is not so reliable as it is often empty and accepts only visa cards. The best option is to bring enough cash for your stay or use the money changers facilities (they have credit card machines to make withdraws in exchange of a 6-7% commission). A common issue on such a small island are electricity cuts. They can happen anytime, last from an hour to a full-day. Fortunately some hotels in Nusa Lembongan have power generators to ensure the comfort of their guests. Most of the accommodation have wi-fi but unfortunately take in consideration that this is a small island and internet can be very very slow…just expect to check your emails and not much more. This is the quietest time of the year, activities and accommodation are around 15% cheaper and the weather is still great with only a few clouds ! Accommodation and activities are at normal price. Busiest time of the year so make sure you book your accommodation and activities ahead to avoid bad surprises. Prices are around 15% higher. Don’t get scared by the words “raining season”, Nusa Lembongan is dryer than Bali and only January and February have rainy days. A “typical rainy day” would be cloudy in the morning, then bright strong sun noon and afternoon, back to cloudy at the end of afternoon then raining a lot at night. So nothing really bad at all, only the power cuts. It gets a bit cooler at nights more especially in August/September so don’t forget to bring a jacket and if you go scuba diving the water can go down to 20 degrees so book an accommodation with hot water to warm up after the dive ! Surf : excellent conditions with medium to big swells and glassy to offshore winds. Get ready to see these big barrels like in surf movies !